Fresh morel mushrooms are a tremendous treat—their earthy and nutty flavor along with their interesting and meaty texture cause even mushroom haters to fall in love. But don't be searching the produce section of the grocery store; these wild mushrooms are often hard-won—either from foraging the forest floor or spending a pretty penny at the farmers market—so you don't want to ruin them with haphazard cleaning. Most mushrooms need just a simple brushing to clean them or, at most, a swipe with a damp paper towel. The sponge-like texture of morels, however, has a tendency to trap dirt and grit, so morels require a bit more attention. This easy three-step method for cleaning them keeps the delicate mushrooms from becoming water-logged. An important note is to clean morels only just before using. The morels will absorb a bit of water in the cleaning process, making them more susceptible to mold or rotting if stored afterward. Until then, keep them as they are (dirt and all) in a paper bag to let them breathe. The first step to cleaning morels is to shake off as much dirt as possible. 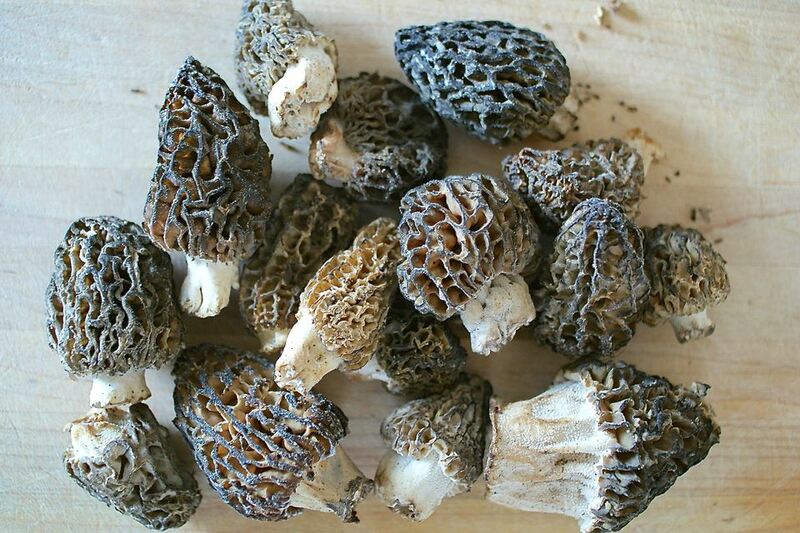 Put the morels in a paper bag or a colander and shake vigorously, but not violently. The goal here is to knock out as much dirt or debris from the morels before cleaning them, but you don't want the mushrooms to bruise or break apart. Now it is time to use a bit of water. Put the morels in a large bowl of cold water (or a clean sink full of cold water) and quickly swish the morels around. The swishing is to help loosen any remaining dirt in the mushrooms, so if you can see dirt coming off, keep going until you don't. Lift the morels out of the water (again, leaving behind any dirt or grit on the bottom of the bowl or sink). If the water is particularly dirty, you may want to repeat the process, dumping out the dirty water and starting with a clean bowl of cool water. Continue the cleaning process until you don't see any more dirt releasing from the mushrooms. Once the morels are clean, put them on a clean kitchen towel or layers of paper towels. Quickly and gently pat the mushrooms dry, jostling them around a bit as you do so to allow any water in the holes to drain out. If the toweling is very wet, replace with dry and repeat the process to be sure all of the water has been removed from the mushrooms' nooks and crannies. Prepare and cook the morels as you like. Or, if you'd rather, dry the mushrooms to use them at a later date. There are three methods to drying morel mushrooms: air dry, oven dry, and using a food dehydrator.